Are you ready for racing season? There’s nothing more exciting than RV camping in the infield! If you’ve never indulged in NASCAR RV camping, here’s a tutorial for getting ready for the races. I. Where Would You Like to Go? Every single NASCAR track works hard to create a memorable experience for die-hard NASCAR fans who also love RV camping. Race weekend at these tracks means a veritable city of RVs and motorhomes springs up, and it’s time for you to be part of it! 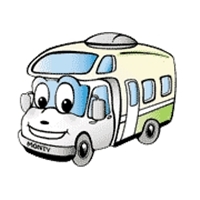 Here are some favorite tracks suggested by our RV rental clients: Kentucky Speedway, Atlanta Motor Speedway, Las Vegas Motor Speedway, Texas Motor Speedway, and Charlotte Motor Speedway. If none of these get your engines revving, check NASCAR.com for information on world-famous tracks like Daytona, Talladega and Chicagoland. As you’re choosing your favorite NASCAR RV campground, remember that infield camping and nearby campgrounds fill up many months in advance, so make your reservations soon. A terrific resource for NASCAR RV campers can be found at LaidBackRacing.com. They charge a minimal fee for the information, but they’ve done an amazing amount of research on campgrounds, onsite camping and local amenities for nearly every NASCAR track. You’re going to find a party waiting at any RV campsite near a NASCAR track, long before the race begins. Make your vacation super-memorable by arriving early. Our clients have shared some great stories about marathon poker games, non-stop tailgating and incredibly friendly fans. If that sounds like the perfect vacation to you, plan to set up camp as soon as the gates are open. You can find information about individual tracks and race weekend particulars at NASCAR.com. The fan guides for each track explain when and where camping is allowed, where RVs can park for tailgating if you’re camping off-site, and the best traffic routes. IV. Know What to Expect! There’s nothing worse than arriving for a long weekend of NASCAR racing and RV tailgating, only to realize the infield camps don’t have hook-ups. If this is your first time RV camping at a particular NASCAR track, head for the track’s online fan forums and ask questions. You’ll find plenty of NASCAR RV camping veterans able to help. RV camping on-site at a NASCAR track is the ultimate experience for racing fans. We’re ready and waiting to help our customers enjoy maximum NASCAR excitement. Give us a call to start your NASCAR season rolling or check out NASCAR Vacation / NASCAR RV Camping on the El Monte RV site. !